Well it’s pretty apparent that I have some kind of major sweet tooth thing going on this week. But next week, I promise to be better! Well actually I have been a good girl all week. Going to the gym, eat healthy meals and drinking lots of water. All of these sweet treats that you have seen this week, were all made last weekend!! It all started when I got chocolate covered almonds from Trader Joe’s. I ate way to many! I actually threw them out because I couldn’t stop eating them. Ever since then I was on a major sweet train all last weekend, but not anymore! I told myself that Monday is a new day and a new week, meaning I’m going to eat better! You’ll see those recipes next week. 🙂 So let’s finish the week off on a healthy indulgence! 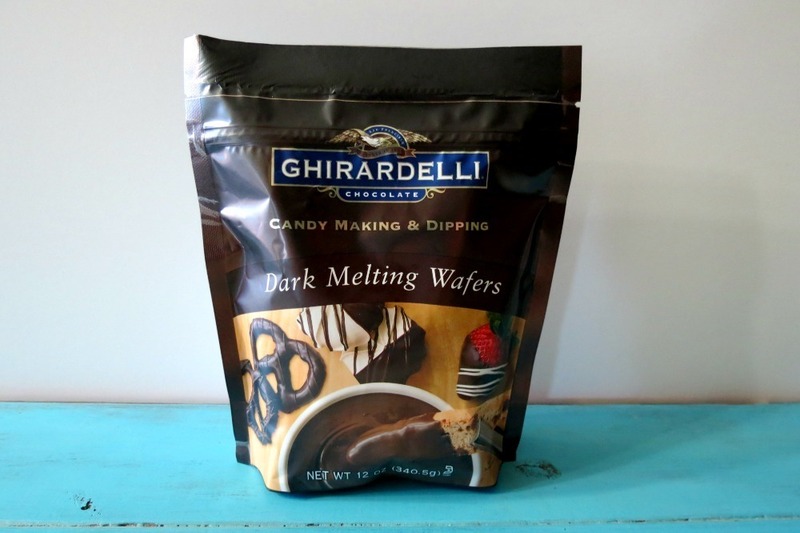 I was originally going to make my Chocolate Chip Cookie Dough Balls and be done with it, then I saw a bag of Ghirardelli Dark Chocolate Melting Wafers at the grocery store and I turned around and there was a display of pretzels. 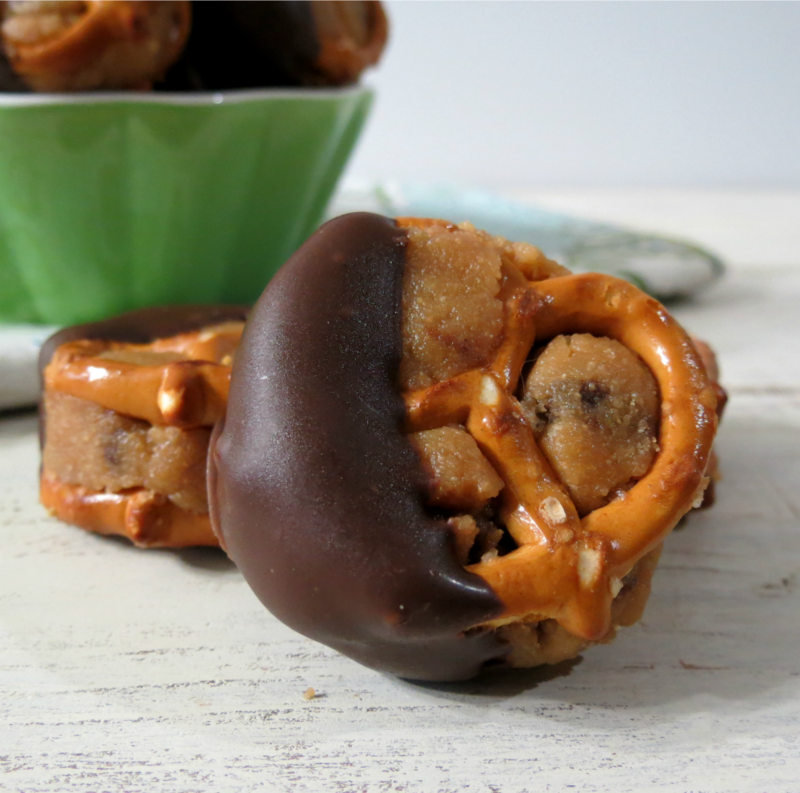 Then I remembered seeing other blogger recipes of peanut butter and pretzel sandwiches and I thought, I so need to do this with my dough balls! That was probably bad on my part but I needed to impress and step up my recipe a bit! So today’s recipe was born! I first made my cookie dough with cashews, maple syrup vanilla extract and a few other ingredients. Then I smushed them between mini pretzel twists. Here they are before they got dipped in chocolate. I placed my smushed sandwiches in the fridge while I cleaned up m mess. 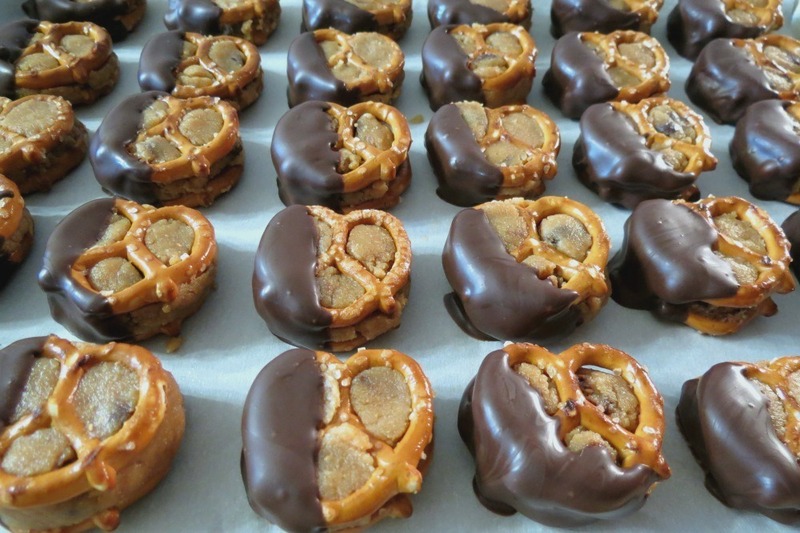 I melted the dark chocolate and gave my pretzels a dip. I didn’t want to much chocolate, just a small bite. I have to say the Ghiradelli chocolate melts like a dream. It’s so creamy smooth and still tastes sweet for a dark chocolate. So good! Placed my finished sandwiches in the refrigerator for the chocolate to set. 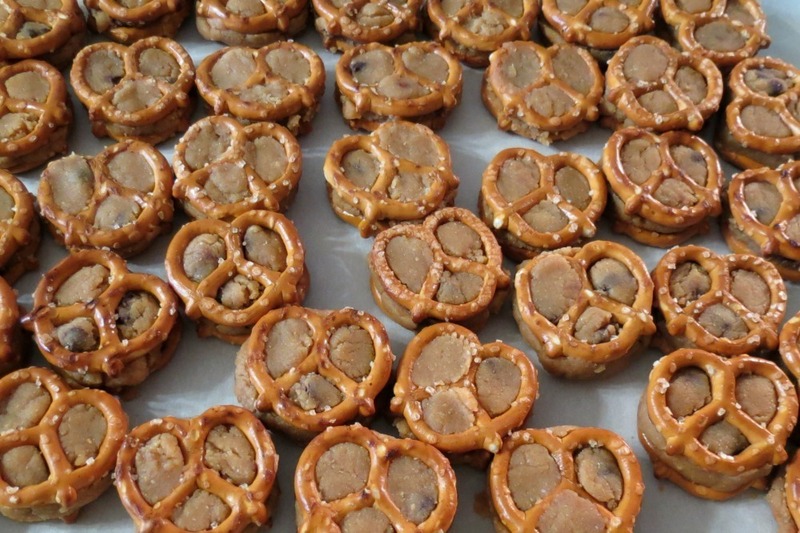 I highly recommend storing your finished pretzel bites in the fridge so the chocolate doesn’t melt. The pretzels stay nice and crunchy and because the dough is made with cashews, they stay nice and soft. So perfect. Since I am writing this in advance I don’t know what my co-workers will think, but I am excited for them to try them. They are really so delicious!! 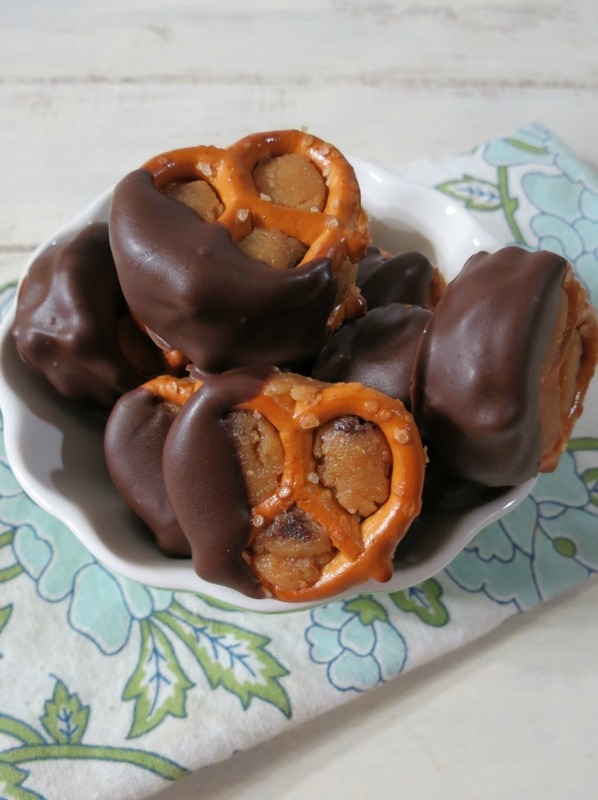 This is a nice healthy treat and all pretty natural except for the pretzels and dark chocolate is good for you, so these little bites are a win, win!! 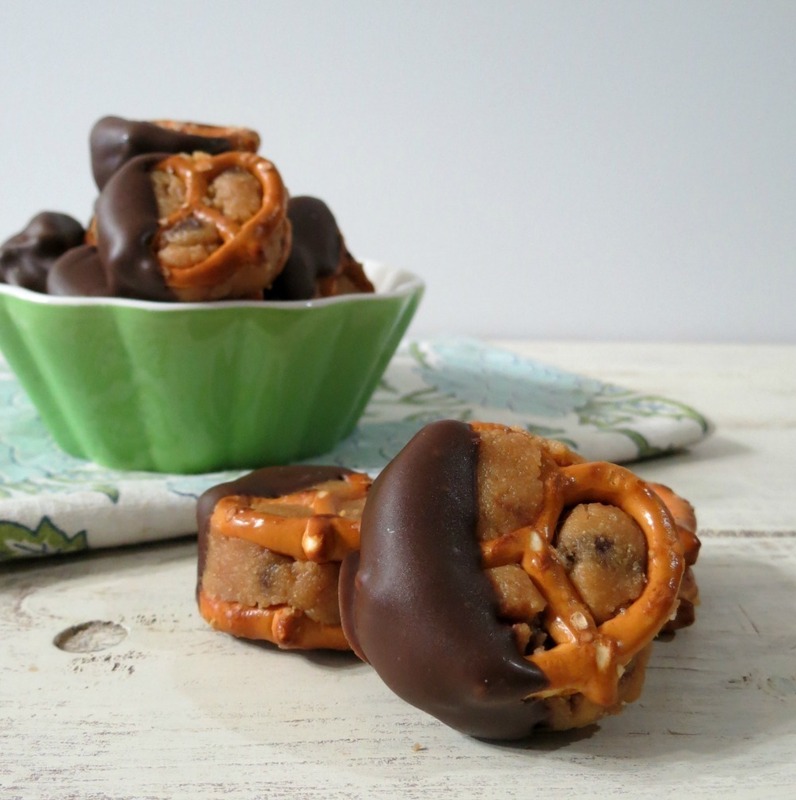 A sweet and salty indulgent snack that tastes like cookie dough that has been smushed between pretzels and dipped in rich dark chocolate. Add cashew mixture into a bowl and stir in flour, until incorporated. Stir in chocolate chips. Take about a teaspoon of dough and form it into a ball. Place dough ball onto a pretzel and take another pretzel and press it over the top to make a sandwich. Do this until you have used up all of the cookie dough. Place the sandwiches onto baking sheet and place in the freezer for about 10 minutes or so. I did it for 30 minutes. In a microwave safe dish, add chocolate and heat for 20 seconds, stir until chocolate is melted. If it's not melting, place back of the microwave and heat for 10 second intervals stirring in between intervals until chocolate is melted. 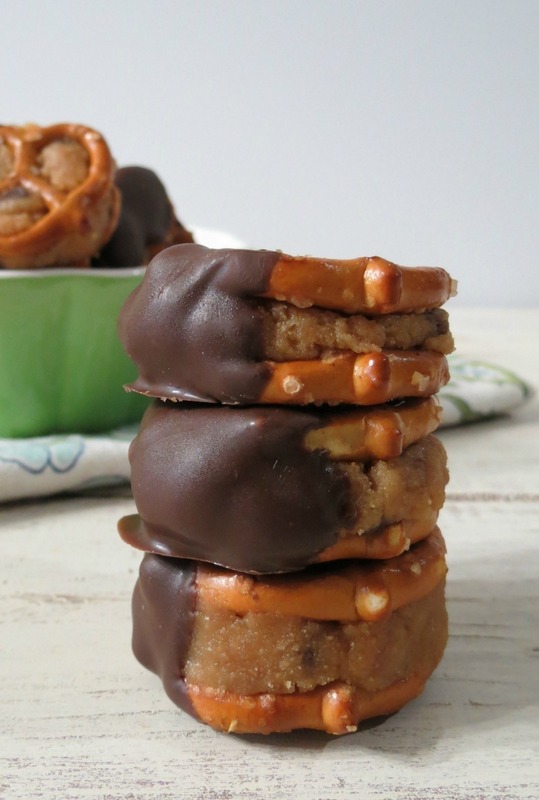 Take the pretzel sandwiches out of the freezer and dip into the melted chocolate. Place back onto baking sheet. Do this until all the sandwiches have been dipped. One last thing! I got an e-mail from OXO and wanted to share it with you. This is awesome!!!! On behalf of OXO and Cookies for Kids’ Cancer, I wanted to say THANK YOU to all of you for your hard work this past month and helping spread the word about Cookies for Kids’ Cancer. All told, there were 78 posts dedicated to our Bake a Difference campaign, featuring mouth-watering Cookies, Brownies and Cupcakes. That means $7,800 raised to benefit pediatric cancer research. 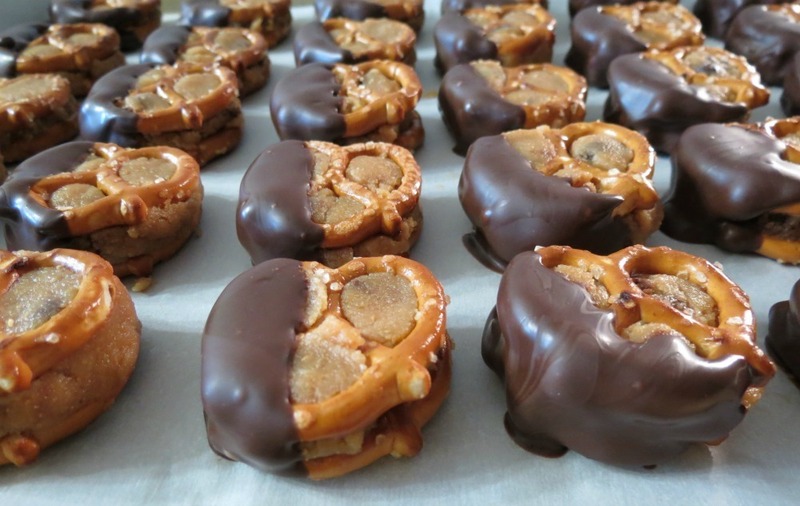 Take a look at all of the delicious, delectable posts on Pinterest. If we missed your post, please let us know via OXO Spot. We want to make sure we have the chance to acknowledge each of you personally. Thanks again for your support and for spreading the word. We couldn’t have done it without you! 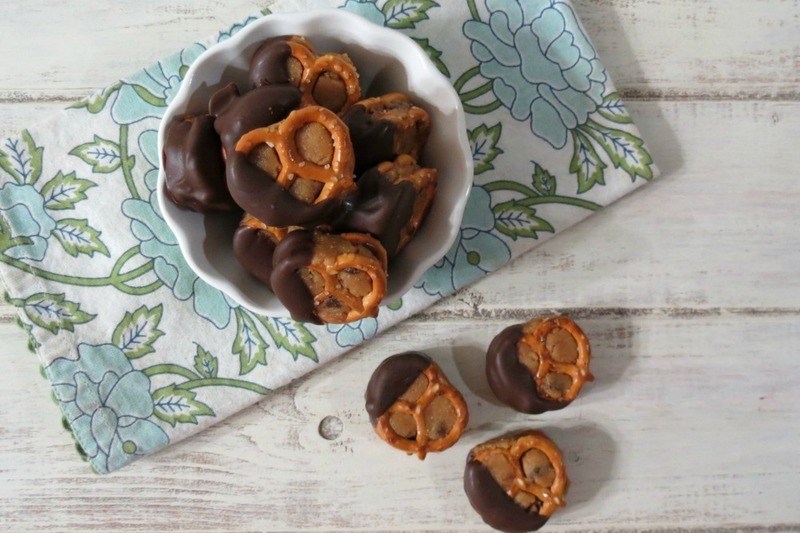 Oh My – I am drooling at these – what a perfect blend of sweet and salty! Awesome post- thanks for sharing – only complaint I have is i wish I was one of your co-workers the day you brought these in! lol! These are horribly addicting! It’s hard to eat just one! Trust me!! These look amazing! So glad I spotted them in the With a Blast link party! Thank you Amy! I just love them!! These look so easy. Perfect for a gift tin- nice change from traditional cookies. What a great idea! I think I will make these for Christmas!! Thank you! Thanks Angie! I said it in my post, but these are really highly addicting!! I want to make them again, but fear I will eat to many of them! just made these and they were awesomely good! i do have a question. When you make any nut butter from scratch, does it change the nutritional value of the nut? Hi Casey! Nope the nutritional value of the nut doesn’t change at all! Your still getting a healthy nut. I love making nut butters because you can add what you like to it to change the flavor or go all natural, which is the best! Plus I think it is so awesome to take a nut and make it into a nut butter. It amazes me that you can do that at home. Making nut butter is one of the main reasons I started blogging. I thought it was so cool to do I wanted to tell the world about it! lol Sounds weird but it’s true! it seriously is the coolest thing! i can’t wait to try another recipe!!! your blog is awesome by the way!!!! Ok…so I am on a juice fast…and your website is officially making me drool on myself! YUMMY! Good for you for being on a juice fast. I need to do that and I plan too, but then I start cooking and I have no control. It’s so hard when you have to cook for your family. Any hints how to make these without cashews? Substitutions? My son is allergic to nuts. You could make traditional chocolate chip cookie dough, just omit the egg and baking soda, mix it up and squish between two pretzels! That would be good! These look amazing!!! I am absolutely making them this week! I have 2 cups of random nuts – walnuts, almonds, peanuts, etc, and of course I have peanut butter… would those work well instead of cashews? Thank you Pat! This is one of my favorite indulgences! It is simply amazing! Enjoy! ok great! 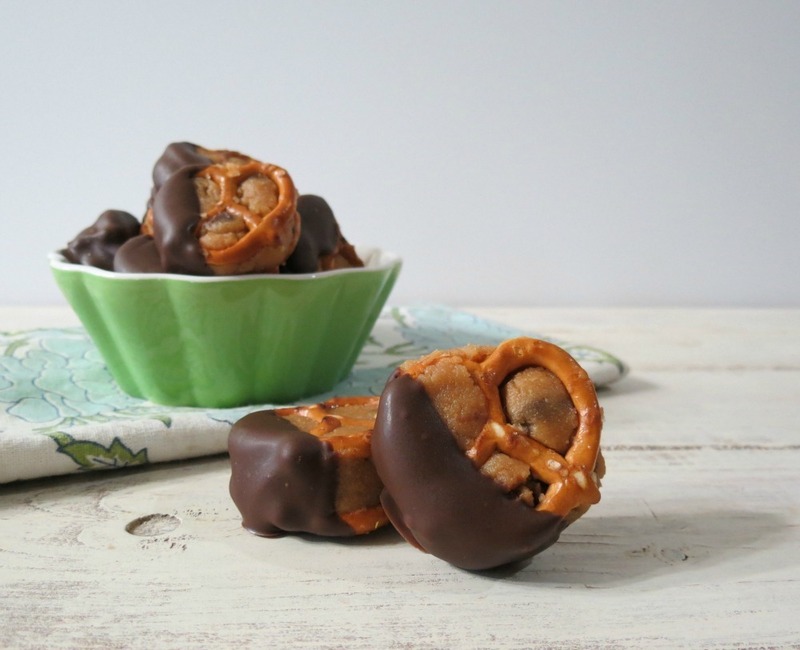 I will make these this weekend then, Love little bites like these to soothe my pb and choc cravings! =p Thanks! I think you will love these little bites! It’s one of my favorites! Matter in fact I made them again about a month ago! I simply love them and I hope you do too! Let me know how they turn out for you! I just found this and am dying to make them, but I wonder what would be the best gluten free sub for the whole wheat flour. I’m guessing a generic all purpose gf blend? Or maybe coconut flour? Hi Cynthia, Yes, I would think GF flour or coconut flour should work out great for this recipe. I hope you enjoy it as much as my friends and co-workers do. It’s s such a great treat!